to Animal Slaughter for Food. (1). Pigs, when no electric power is available, whereby these animals are stunned; without detriment to the carcase, by means of an electric shock. (2). Sheep, unless the Local Authority protects them by providing in its Bye-laws that they must be stunned. (3). All animals killed for the food of Jews or Mahomedans. There is no real excuse for any of these prohibitions, and one of the first acts of a Fascist Government in Britain would be to abolish them. The many societies that exist for the protection of animals from cruelty have had a very long and hard fight to arrive even at the unsatisfactory stage in which the 1933 Act leaves us; they have had tremendous opposition from the trade, and the British people have no reason to be proud of their indifference and inaction in face of the fact that sheep, in particular, have been, and often still are, subject to a shockingly dirty death at the hands of the butcher. Nevertheless, the slaughter of cattle has at last been made humane where Gentile food is concerned. Why, in a country calling itself Christian, and with a population Aryan or of Aryan strain, should Jews and Mahomedans he allowed to kill their cattle by methods less humane than those we ourselves have adopted? It is of course necessary that all animals killed for human food should be thoroughly well bled, and this is done by cutting the throat, so that the heart itself pumps the blood froth the animal before it stops beating. The Aryan or Christian has decided that his cattle shall be stunned first so that they will not feel the anguish of the cut and the awful struggle against death which follows it. The Jew and the Mahomedan claim and receive exemption by British law from following the Briton’s example. The excuse is that to the Jew and to the Mahomedan, the slaughter of food-animals has to be conducted as a religious rite; and that this rite does not allow of the humane process of stunning the animal before its throat is cut. Actually, Mahomedans willingly waive their religious objections to stunning the animals, and I have myself found that in the East they are easily persuaded to allow animals destined for their food to be shot through the head provided the throat is severed (with the utterance of a prayer) immediately afterwards, whilst the blood can still flow freely. In a letter to the R.S.P.C.A. the Imam of Woking Mosque wrote on 4th September, 1928, that in his opinion the use of the Humane Killer (a stunning instrument) does not collide with the instructions given in the Koran. But in the case of the Jew, the animal-protection societies have been faced with an obstinate refusal to acquiesce in the abolition of this cruel “religious” custom, despite the fact that every Jew living in Britain, whatever the law may now say, is a stranger and an alien. Even stunning by electricity has been declared inadmissible by the Rabbis. Only one of these animal protection societies has put up any real fight against the Jews; the others have surrendered because of the large subscriptions received from Jews to prevent these organisations taking the matter up seriously. Money talks louder than Love! A Power which can bring our Nation to war against its enemies who are not our enemies, finds it comparatively simple to stifle British attempts to do justice to its own bullocks! What is Shechita, the Jewish Method of Slaughter? It is quite simple; it is cutting the throat from ear to ear without previous stunning, and letting the animal bleed to death. Before the throat?cutting can be done, the bullock has to be thrown to the floor, or “cast,” as it is called. Various methods of doing this are used, the usual procedure being to rope the feet together, pass the end of the rope through a ring in the wall, and pull the rope until the animal falls. Naturally, on the hard floor of the slaughter?house, this is rough treatment, and when, as sometimes happens, the animal’s horns are broken in the fall, it causes acute suffering, for a broken horn means a broken bone in the case of cattle, the horn having a bony core. To mitigate the violence of casting, indiarubber or straw mattresses have been employed, but are not in general use. A Jew named Weinberg adapted the invention of a Veterinary Surgeon to the purpose of painless casting of bullocks for Jewish slaughter. This resulted in what is known as the Weinberg Pen, into which the bullock is driven and secured; then the pen, like an operating-table for horses, is rotated until the bullock is upside down, ready for the cut. But, as the Jewish B’nai B’rith in Leeds reported in 1927, the Weinberg Pen is not used, even when provided, unless visitors are expected. When the throat is cut, the wound in an ordinary bullock is twelve inches long and gapes twelve inches wide when the head is forced back. Thus forcing back of the head to tense the throat tissues is done by means of a lever. Seeing that twelve inches of skin are cut through, albeit that the knife used is always extremely sharp it would seem impossible that anyone could be persuaded that the Jewish method of cattle-slaughter is justifiable as long as methods precluding pain are available. Even a child soon learns (it is one of the first things it learns) that to make even a nick in the skin, is very painful. Yet, to their discredit, many people have defended Shechita, including physiologists and veterinary surgeons. I maintain that any individual is as competent as any so-called “expert” to judge whether Shechita is painful or not; by merely exercising common sense. If it is not painful, why is it necessary to throw the animal down before the operation can be done? If it is not painful, why are criminals not executed that way instead of by dislocation of the neck? I have heard it stated, even, that if it was painful, the bullocks would cry out! Could you cry out if your throat was cut? However, people like to have the views of experts, so you shall have them. 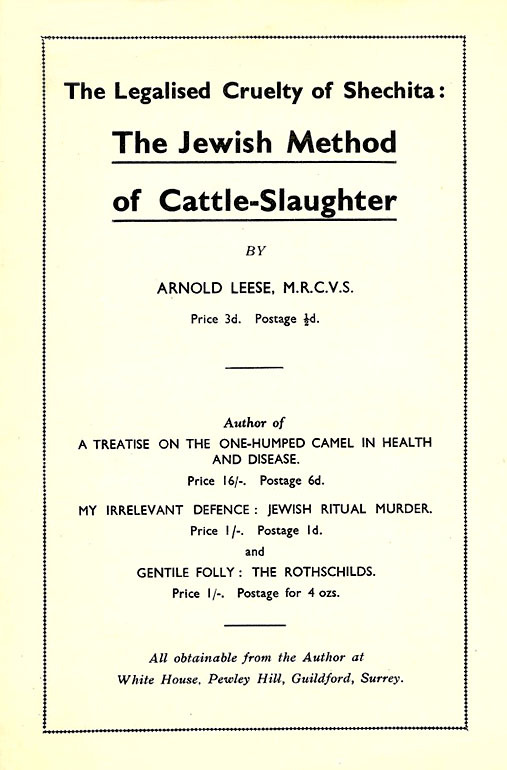 Perhaps the most authoritative condemnation of the Jewish method of cattle?slaughter was a report made by an Admiralty Committee in 1904; this committee was interested in the matter from the point of view of rationing the navy’s food. The report was backed by two physiologists, Professor E. H. Starling, Jodrell Professor of Physiology, London University College, and Sir Michael Foster, Professor of Physiology at Cambridge. The report’s conclusions were that “the Jewish system fails in the primary requirements of rapidity, freedom from unnecessary pain and instantaneous loss of sensibility” and that “until some method is devised for rendering the animal unconscious, it should not be permitted under any establishment under Government control.” That, surely, is definite enough; but this report, 35 years old, has simply been pigeon-holed and nothing has been done about it. The First Lord of the Admiralty at that time was the Earl of Selborne, who had been private secretary to the Jewish H. C. Childers, and was later co-director with the Jews S. B. Joel and Sir S. Neumann in the African Banking Corporation, and with the Monds (Jews) in the Natal Ammonium, Ltd.! If the report had ever got past him, it would have been stopped by the Rt. Hon. A. J. Balfour, who was Prime Minister, and who promised Palestine to the Jews later on! Dr. Klein, Director of the Abattoir at Lennep, Germany, made some simple experiments in the presence of nine veterinary surgeons; he performed these on several animals, which had had their throats cut by the Jewish method. The experiment simply consisted in cutting the ropes binding the animals’ legs immediately after the cut was made. The animals then rose to their feet, staggered about fully conscious, then sank to their knees and finally collapsed. Klein found that con­sciousness remained for at least forty seconds after the cut. He concluded that “the Jewish method must be forbidden in our civilised country” and when Hitler came to power, it was. Death would of course come quicker to these animals on which Klein made his observations than to animals remaining prostrate and secured, because the muscular exertions in rising and moving about would greatly hasten the bleeding. Mr. James King, Veterinary Inspector to the Corporation of London, said that in his experience it took three or tour minutes before animals slaughtered by the Jewish method lost sensibility after the cut. In 1933, a questionnaire was sent to 605 Dutch Veterinary Surgeons, with the result that 500 condemned the Jewish method as unjustifiable. The following year, the Melbourne Argus (29th Aug.) published reports from Chief Inspectors to the Health Committee, New South Wales, who almost unanimously condemned Shechita on account of its cruelty. For many years, the method has by law been prohibited in Norway, Sweden, Finland and parts of Germany; now it is stopped everywhere under Nazi rule. Switzerland prohibits by a law which is honoured in the breach rather than in the observance. The method has long been expressly condemned also by the Director of the Abattoir in Brussels. Mr. F. Marshall, M.P., spoke in the House on the subject. “No terms of mine,” he said, “can describe the horror of the Jewish method of slaughter. It is the absolute acme of cruelty and pain.” Needless to say, he was defeated at the next election. Apologists for the Jewish Method of Slaughter. Professor Sir Leonard Hill, physiologist, says (Lancet, 22nd Dec., 1923) that the bullock does not feel the cut of the Jews’ knife. On another occasion (in May, 1932, speaking to an audience of Jewish slaughtermen) he said he had no doubt that when the Weinberg pen was used “the animal is brought by this method into a confusional state, which is equivalent to a hypnotic condition.” In other words, the Professor suggests that to hypnotise an animal, all you have to do is to turn it upside down! I suggest that it is the Professor himself who has been brought into a hypnotic condition, and we feel positive that there is a close Jewish relationship which produced it. Another physiologist, Sir W. Bayliss also defended Shechita, but with a name like that, and a father called Moses, it is not altogether surprising. General Sir John Moore, Director of Veterinary Services in the Great War, wrote in 1931 to the Shechita Board: “I consider that the complete severance of the large blood vessels of the neck in the act of cutting according to Jewish ritual is a quick and humane method of despatch.” Sir John, however, is a Freemason, and we may dismiss his opinion with contempt in view of the experiments of Dr. Klein already mentioned; besides, the vertebral arteries supply the brain with a considerable amount of blood and are not severed when an animal’s throat is cut. The late Sir Frederick Hobday, Principal of the Royal Veterinary College, described the Jewish method as the most humane in the world (Jewish Chronicle, 28th Nov., 1938, p. 12). In July, 1927, Hobday wrote to the Jewish Chronicle to say that he was taking a party, including ladies, over a foreign abattoir; and “we had the misfortune to witness two instances in which the horns were completely broken off (one in each case) during the process of casting for the Jewish killing. The sight was most revolting, even to a hardened man.” What a curious mentality! I should have thought the misfortune was to the bullocks rather than to the onlookers. Sir Frederick’s hardening process was gained in three Masonic Lodges, Nos. 3386, 2190 and 4474, and he was one of the founders of the last mentioned. Mr. C. A. Lovatt Evans, Professor of Physiology, University of London, is quoted by the Jew C. Roth in The Jewish Contribution to Civilisation as saying: “I should be happy to think that my own end were likely to be as swift and painless as the end of these cattle killed in this way undoubtedly is.” Words fail me in attempting to comment upon this alleged statement. Some Jewish apologists for the method would be almost amusing were the subject less grim. The Jewish Chronicle, 16th March, 1923, says: “If the eating of flesh is a necessity, then it is passing fudge, hypocritical humbug and cant, to worry about a second or two more or less of pain occasioned to the animal in procuring it.” We agree, it would be, to a Jew; but not to the average Aryan, who would regard even “a second or two” as of some importance, and forty seconds and more as sufficient to condemn the method and all who advocate it. Reading all these recommendations of the method, we wonder the R.S.P.C.A. has not been prevailed upon to join in them; but the fact remains that it hasn’t. Why not? Once more, I repeat, because it is sheer common?sense that cutting the throat from ear to car is a ghastly painful process, and it is impossible that contrary opinions by sane men can be honest ones. The Extensive Use of Shechita. Most of my readers probably think that shechita is only practised upon animals destined for the food of Jews. It is most important that they should realise that the method is used far more generally than that. In London, not less than 1,000 bullocks every week are done to death by shechita. In Antwerp, all cattle are killed that way. In New York, 90 per cent. (about 8,000 cattle, and 100,000 sheep every week). Because Gentiles eat most of the carcase of an animal killed by the Jewish method. Jewish ritual forbids Jews to consume the hind quarters of beasts killed for food unless those hindquarters have been subjected to a process called “porging.” This porging consists in the removal by dissection of certain blood vessels and fat, a dissection which requires some skill and which therefore is seldom resorted to. Thus, for practically every beast slaughtered by shechita, there is a whole hindquarters available for Gentile consumption. That is why the number of animals slaughtered in this method so greatly exceeds the needs of the Jewish population. Moneymaking is the Key to the Situation. The obstructive tactics employed by Jews to prevent the abolition of this unnecessary suffering to our animals is due to the fact that the Jewish community gains large sums from fees received for the services of the Jewish slaughterer. In 1939, at Glasgow, these fees amounted to 13s. before they were raised to 15s. 6d. per head. The fees are used for the religious education of Jews and for other Jewish purposes. As the fees are included in the price of the meat to consumers, it follows that most of the shechita fees paid in this so-called Christian country are really paid by Gentiles who eat most of the meat. Thus, the Gentile is cunningly made to pay for Jewish educa­tion and Jewish charities out of unnecessary cruelty to British bullocks! Did you know that? Well, you do now. Jewish Board of Guardians £130. Ladies’ Bikur Cholim Society £25. Jewish Temporary Shelter £10 10s. Jewish Orphan Aid Society £10 10s. Jewish Ladies’ Benevolent Inst. £6 6s. Hebrew Philanthropic Society £5 10s. Hebrew Children’s Soup Fund £5 5s. Society for Protection of Jewish Girls £5 5s. Liverpool Jewish Children’s Country Home £5 5s. Jewish Boys’ Clothing Society £3 3s. Sewing Society for Clothing Jewish Poor £3 3s. Jewish Children’s Clothing Society £3 3s. Rabbinical Commission for Licensing of Shochetim £10. Now do you see what is behind this Shechita business? Some thoughtless people would have Shechita protected because it is a religious rite. Sutti, the burning of Hindu widows, was a religious rite in India, but we stopped it. Thuggee, the religious strangling of fellow-travellers was also a religious rite in India, and we stopped that, too. It is utterly ridiculous to claim that barbarism should be perpetuated in this, our own country, to protect an alien ritual. Shechita is no part of the Mosaic law, but was prescribed by the Rabbis. There was money in it. The Jews did not even invent it, but copied it from the Egyptians. The Beni Hasan models from Egyptian tombs of the 12th dynasty show the process, and the exodus, if indeed it ever took place, is supposed to have happened in the 19th dynasty. My Experiences with the R.S.P.C.A. A man in the body of the hall said he wished to call the meeting’s attention to a revolting case of cruelty to animals, and explained that it had reference to the Jewish method of slaughter. The Chairman: I rule it out of order. I won’t have it discussed here. Mr. A. S. Leese: This is a society to prevent cruelty to animals. Does not the Jewish method involve cruelty to animals? Some twenty-eight years ago it was condemned by the government. The Chairman: I cannot have a debate in open house on this question. I won’t have it. Mr. Leese: We are trying to stop it. I am sure the meeting wants to hear it; let’s have publicity. The Chairman: I won’t have it. Mr. Leese: Let’s get on with it. The Chairman: You won’t get on with it here at a public meeting. Another member of the audience: Would you tell this meeting where it can be discussed? Even in London they won’t do it. The Chairman: The Committee in London lay down our policy. I decline to allow a question which is open to libel to be discussed at this meeting. The real cause of this opposition to reform by the R.S.P.C.A. was fear of losing powerful Jewish and Masonic financial support. I hope that the new Secretary will prove strong enough to initiate proceedings whereby the practice of Shechita may be made illegal. I have always found that the audiences were sympathetic to my efforts, the excited opposition coming from the platform and the Chair. I will conclude by showing how, even under the present law, it should be possible for an honest, powerful anti-cruelty society to put an end to most of this miserable business, if not quite all of it. The Slaughter of Animals Act (1933) allows the killing of animals by the Jewish method, but only for the food of Jews. If, then, a Jewish slaughterman uses the method for despatching a beast the carcase of which will not be porged, he breaks the law because the beast’s hindquarters will not be eaten by Jews but by Gentiles. The vast majority of carcases of beasts slaughtered by the Jewish method are not porged. This being the case, the Jewish slaughterman should, in reason and in law, ascertain for himself, before killing the beast, that its carcase is intended for porging. If he kills the animal by the Jewish method and the carcase is not then porged, he has broken the law. 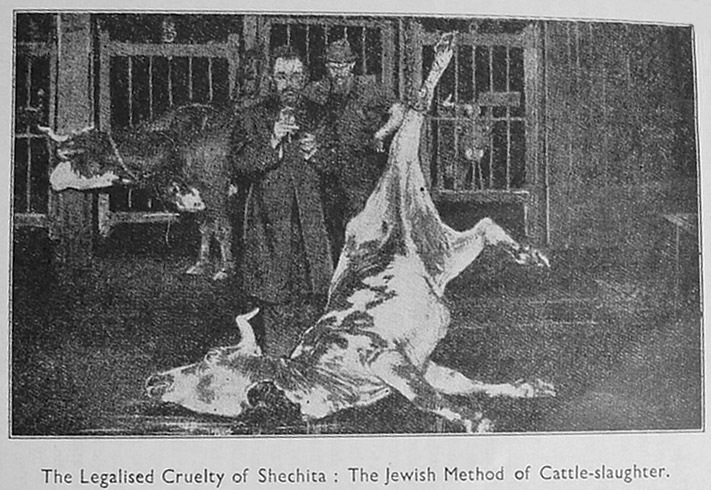 The rich animal protection societies, then, have only to send an Inspector to the slaughter?house to keep a watch on the Jewish slaughterers and on the disposal of the carcases, and could bring enough prosecutions as a result of a single day’s observations practically to end the scandal of the Jewish method of slaughter altogether.